I spent last Saturday roaming from one restaurant to the next (best idea ever). I had loads of wonderful food and was able to try out three new restaurants. Having spent the night before trying to capture images of Donnie Walberg, the battery on my camera was flashing a low signal before we’d even had breakfast. So by dinner time, my camera was completely dead which meant I was unable to capture the beauty of the fine meal we had at Biella’s in Excelsior. Luckily for you my food recall is as sharp as a tack. Please enjoy the illustrated version of Biella’s (actual food may vary in appearance). 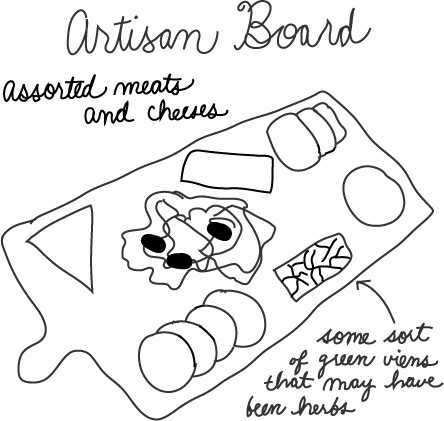 We started out with the Artisan Board which featured a variety of meats, cheeses, and antipasti. There were some wonderful cheeses on this plate; my particular favorite was one that had vibrant green veins of what I think were tasty herbs. This is unconfirmed, but definitely delicious. 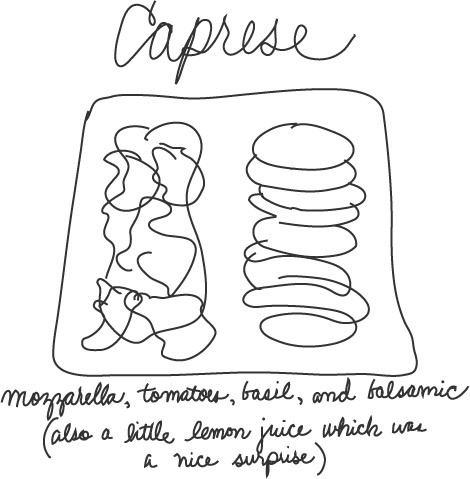 I am pretty sure I have never passed up Caprese on a menu. I love the flavors and textures of fresh mozzarella, tomatoes, basil, and balsamic. In this version, they’ve also added a light lemon flavor which was a great addition to the traditional salad without being distracting. Which is good, because I don’t like anything to get in-between me and a plate of tomatoes and mozzarella (sort of dangerous). One of the things I really loved about Biella’s menu is that they have an option for a full or half order for many of their entrees. I chose a half order of the Lobster Ravioli, which was plenty for a meal. 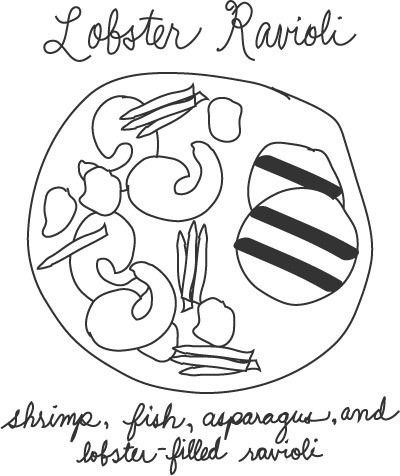 Filled with a variety of seafood and asparagus, the dish was full of flavor and tasty bits. There were two good-sized ravioli that were beautifully striped (I’m thinking could be squid ink, but this is also unconfirmed). All of this was followed by two desserts that we shared. They disappeared so quickly they hardly register in my mind’s eye. The dessert menu changes regularly and they feature two different cheesecakes daily. 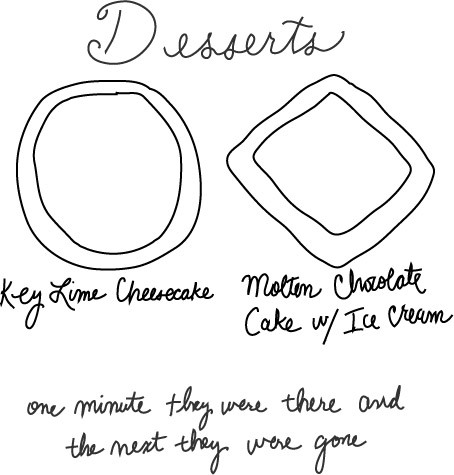 Be sure to save room for dessert.